procedure please see the information below. 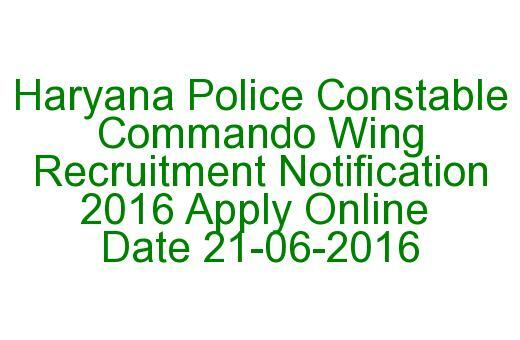 Click here to see the official advertisement of Haryana Police Constable Commando Wing Recruitment. completely reserved for Men Candidates only. As on 01-05-2016 the candidate age limits are 18-21 years. no age relaxation for any categories. is held in three stages. and for all the others is Rs.25/-. eligible for the written test. have to apply through online only. Offline mode is not accepted. online must read the official notification and instructions to apply online. Click here to apply online for the Haryana StaffSelection Commission Police Constable Commando Recruitment 2016. 2016 article to your lovable friends through online via social web.